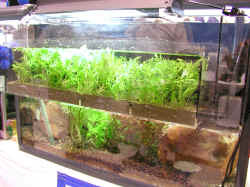 An EcoSystem Hang On Refugium filter unit for freshwater/plant tanks, stocked with Water Sprite. I'm looking to set up a 30gal freshwater planted aquarium. I have some basic brown gravel but was wondering if that was the best option for planting live plants. I'm considering using EcoComplete or even mixing the two. filters along with an overhanging tetra filtration system. Would it be unavoidable to use the EcoComplete with an UGF? My goals for this project is to create an environment focused more on the aquascape than fish, but still plan on including fish in the system. I'm still very new to all of this, so I'm looking for a solid, basic setup that won't limit me to only growing certain kinds of plants or fish. Also, I would like to assemble some pieces of driftwood to create a centerpiece. Any pros/cons or directions I should be aware of in attempting that? I'm looking to set up a 30gal freshwater planted aquarium. I have some basic brown gravel but was wondering if that was the best option for planting live plants. My goals for this project is to create an environment focused more on the aquascape than fish, but still plan on including fish in the system. I'm still very new to all of this, so I'm looking for a solid, basic setup that won't limit me to only growing certain kinds of plants or fish. So would it be a better idea just to start with the gravel and see if the plants will take? It sounds better to utilize fertilizer pellets than to battle too many nutrients. I've always been advised to use an undergravel, but it's sounding like it's not the best option for a planted aquarium. If I opted to remove it, how would that play out with cleanings and longterm care? Is it more efficient to use both as I originally intended? I have a 150 gallon (48 x 24 x 30) I want to setup as a planted community tank. I will stick to small, appropriate fish such as tetras and danios and Corydoras. I haven't yet purchased filtration or lighting. I have purchased laterite and Activ-Flora Premium Planted Substrate - Lake Gems for the substrate. I have also purchased some Manzanita driftwood. I would like to go with a moderate lighting setup. If you were starting from scratch with this tank, what filtration and lighting would you choose? Thanks Bob. I like Eheims as well. Would two 2217s work or would I be better off with one of the pro models? If the pro models, which do you like. I plan on running two inline heaters for redundancy. Is that wise or would I be better off with in tank heaters? I'd like to keep them out of the tank if possible. I have set up a 150 gallon acrylic tank previously used for saltwater, 24" tall, 48" wide and 30" deep. When I bought this used, I cleaned it up nice and converted it to freshwater since this is all I have ever done. This was the first time I had passed a 55 gallon tank and wanted to switch to canister filters for the first time as well. Not knowing ANYTHING, I read up on filters and decided on what my pocketbook could hold. Two Marineland Canister filters with 530gph each. Since my tank is a community tank, I wanted to add plants to this tank to reduce nitrates and eventually do less maintenance on it. I am trying to put together a Fish tank with plants, not a planted tank with fish, so my fish are the priority with having plants as a bonus. I do not want to work with CO2, or do I want to add fertilizers, so the plants that grow would need to be hearty and low maintenance. I have chosen a light fixture for plants to help with photosynthesis but my problem now is my filters. I found out that with plants you don't want lots of water movement, but just minimum. With these two filters, there is no spray bar that they make for this filter to reduce water flow and I found out that there is not a way to reduce water flow from the filter, so its full force from both filters. I can angle the nozzle of the output but it really gives the water a good push. On the flip side, I don't know how much I can reduce water movement without making my fish miserable. Is there anything you can recommend I can or should do, or do I need to get a whole new type of filter that has these adjustments on them and the ability to attach a spray bar? I was thinking of removing one filter completely, so I am using one 530gph to see how that may work but then I wasn't sure if that would be enough filtration for my size tank. I thought 5x my tank size so that would be 750gph, not 530. Second, I have a pile of driftwood that my fish hide in and was told that with planted tanks, you should only need to syphon the surface only of the soil. <Shouldn't really need to do much siphoning of the substrate at all. In a standard planted tank the fish species kept are all very small: Neons for example. The solid wastes produced by these fish -- faeces, uneaten food -- are so small that they break down quickly and are absorbed into the substrate. Up to a point, this "mulm" contributes nutrients the plants can use, particularly CO2, as the bacteria break down the organic molecules. Well, after setting up my tank seven months ago, I decided to move my deco around just a little bit and found lots of poop debris under the pile of driftwood. I couldn't syphon just the top so I had to dig into the soil a bit since there were no roots to disturb. Someone I know has a planted tank and he says he doesn't have any issues with anything building up. So I don't know what I am doing wrong there since I am not really supposed to move and disturb everything in a planted or semi planted tank. Third, since my tank has been running for seven months now and plants have taken root and some have started to grow, my nitrates are still at 40ppm. I do water changes every couple of weeks but I can't seem to get the nitrates down, even with the plants. I thought that they would reduce the nitrates so either they are reducing nitrates and they would be higher or something isn't quite working. 0 ammonia, 0, nitrites, 7.6 ph, nitrates 40ppm. I had some large plants that were growing great a couple of moths ago. I trimmed them down for the first time and they just haven't grown back. I just have no idea what I need to look for in order for me to fix it. Any help or ideas would be GREATLY appreciated. I have a dilemma with my planted tank. I have been told I should get some floating plants in my tank. My problem is my filters water pressure pushes the floating items to the other side of the tank and, eventually, to the intake filters (please see pics). I have a large 150 gallon tank and had to buy two canister filters that produce 1000 gph total (about 500 each) but the pressure the two output hoses produce is incredible. I have to be careful where to aim it because it will blow all my gravel and soil around and ends up pushing my plants everywhere. I have some live plants that I try to float within the large plastic floating plant but when they get out of the safe zone of the fake plant, they go right to the filter. I pull them off and try to hook them to the fake plant again but eventually they work themselves loose. Can you tell me how people who have planted tanks are able to let them float on the top without disturbing them? <I have the outflow at one end of the tank, the inlets close to the bottom of the tank, and floating plants get stuck and the other end of the tank. I have looked for a spray bar to attach and reduce pressure but the Marineland canister filter do not have anything like this for accessories. I have gone to the LFS and their tanks are about 20-30 gallon and hardly have any water flow which seems serene and quiet but they also have very few fish to require a filter. Do I have any options or do I just add some plastic plants and hope for the best? Ok, I will check to see if I can manage some sort of spray bar for my tank but my next question is...If I add a spray bar to my filter, won't that then reduce the gph the filter is siphoning? <To a small extent yes, but that's why you use a generous filtration estimate like the one I suggest. In practise, so long as ammonia and nitrite remain at zero, and assuming the fish show no signs of oxygen deficiency, things are fine. The value of the 4, 6 or 8 times the volume of the tank in turnover per hour is that it's a generous estimate that allows latitude for things like spray bars, clogged-up media, and so on. When manufacturers say that a filter is "suitable for a 20 gallon aquarium" that usually means under the best of circumstances: clean media, small fish, regular maintenance. I was shopping yesterday and looked at a box of cereal that contained 450 grammes, and the calorie count was given per 40 grammes serving. I don't know about you, but 40 grammes is a very small serving! The cereal manufacturer was trying to advertise that their cereal was both low in calories and good value, since the box contained about 11 servings. Also, since the filter cannot push out nearly as much water with the spray bar, will it have any effect on the filters motor burning out or heating up? Last, would it be wise to place a spray bar on both or just one output tube? As for my "floating plants" These are clipping that have come out of their weighted tie down but I was trying to show what would happen with any actual floating plant I would place into the tank. I want to stay away from any java fern types. The strings always float away and get caught in the impeller in my filter. It's just a pain to me. And last, yessssssss, such an algae problem. Two month old tank that finally got done with diatom algae, green hair algae and now I am battling BBA. What a nightmare. Water changes reduced the Green Hair Algae but the BBA is a nightmare. I am going to cut clippings off of the plants affected. the Hygrophila and Anubis have gotten the brunt of it. I read online that Flourish Excel seems to have helped several people with BBA in their tank so I am going to try that. <Wouldn't bank on this. Black Beard Algae is red algae, and red algae grows most in tanks with mediocre light and poor plant growth. The true Siamese Algae Eater will consume it, as will certain other fish such as Florida Flagfish and Ameca splendens (though this last species is very nippy). so i have this 55 gallon tank that I've been given charge of. it's been going for about 7 years. no plants, weak light. I'm putting in our budget next year money to up grade the lighting and put some plants in (and some more fish whee). I've been reading all over on how to do a planted tank right, but converting a non planted to planted with my substrate I'm still not sure on. i currently have what i suppose could be called "generic aquarium gravel" in there. the pieces being .2 to 1 cm in size i guess. and an under gravel filter going on. i understand a finer substrate is in order for a planted aquarium. but then, i don't exactly want to redo the entire eco system...so my thinking is that i will take about half the current gravel out and replace with something finer, probably some made for plants branded substrate on top of what i have now and let it over time mix up. Ok? The real worry i have and my question is this undergravel filter. what happens when i shut it off? I'm not wanting to dig into the nasty underneath it and pull it out. I hope just to pull out the upshoot tubes and leave the thing in there. My hope is that all the detritus that's been sucked down inside it and to the bottom level of the gravel will just wait and become nutrients for the plants once the roots get down that far. But that will take some time. what do i have to worry about for the water of the aquarium when that stuff in the under gravel filter gets used to not having water pass through it?